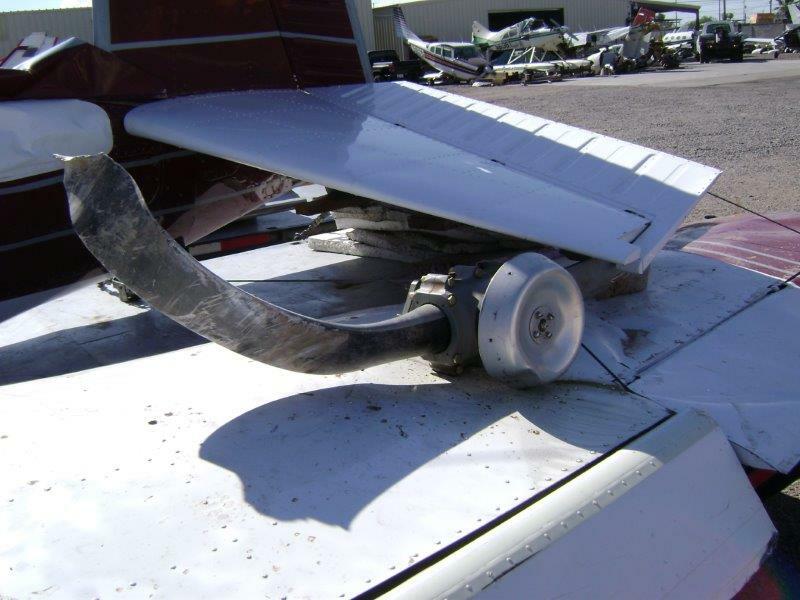 On May 07, 2016, about 1655 mountain standard time, a Beechcraft G35 Bonanza airplane, N4401D, sustained substantial damage during a forced landing following a reported loss of engine power near Surprise, Arizona. The flight instructor was fatally injured and the private pilot sustained serious injuries. The flight was being operated as a maintenance check/instructional flight under the provisions of Title 14 Code of Federal Regulations Part 91 when the accident occurred. Visual meteorological conditions prevailed and no Federal Aviation Administration flight plan had been filed. The flight departed Glendale Municipal Airport (GEU), Glendale, Arizona about 1630. A witness who observed the airplane descending over a parking lot stated that the airplane appeared "low, slow, and quiet." The airplane then disappeared behind a building, and subsequently impacted a green belt in a residential area. Multiple residents close to the accident site heard the sound of impact and alerted first responders. The flight instructor, who also held a mechanic's certificate, was asked to complete a maintenance flight after the airplane had recently been serviced. He elected to use the accident flight to provide instruction to the private pilot who requested a checkout in the airplane. Review of preliminary radar data indicated that the airplane made one circuit in the airport traffic pattern before departing the airport to the northeast. About 10 miles north of GEU, the airplane made a 180 degree right turn followed by a 270 degree left turn, and subsequently entered a constant descent which continued to the last radar return, located about .15 miles southeast from the accident site. The initial impact point (IIP) was identified by several broken tree branches on a eucalyptus tree, about 30 feet above ground level. The airplane continued intact from the IIP along a 242 degree magnetic heading for about 100 feet before impacting a large pine tree. 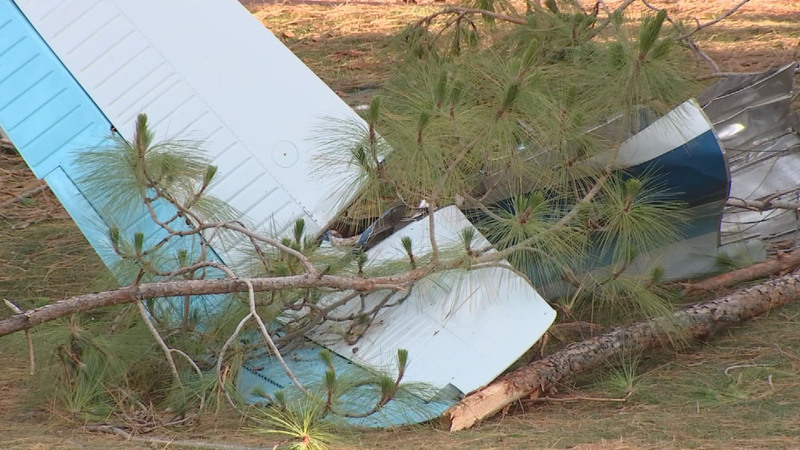 The wings and empennage then separated from the fuselage, which came to rest inverted about 30 feet from the pine tree. All the major components of the airplane were accounted for at the accident site. A detailed examination of the engine and airframe are pending. 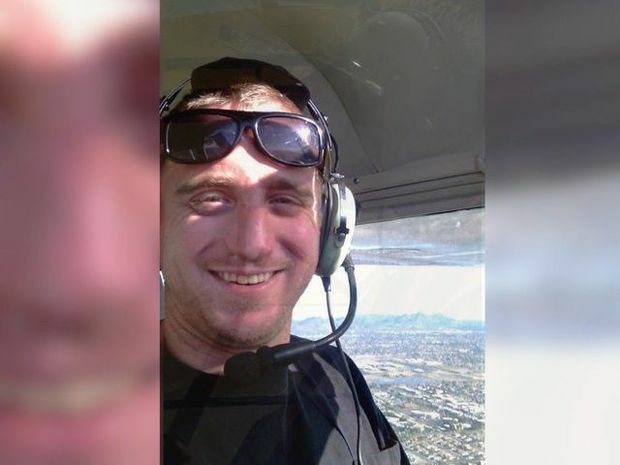 Peoria resident Josh Merrill, shown in an undated photo, likely saved his passenger and dozens of people on the ground by his actions prior to the crash of his small plane in Surprise May 7. Merrill was killed in the incident. GLENDALE, Ariz - It was his split-second decision-making that likely saved dozens of people on the ground as well as his passenger on board. Joshua Merrill’s family spoke for the first time to ABC15 about the crash that claimed his life May 7. "He soloed at 16 and got his private pilot's license at 17,’ said Al Merrill, Joshua’s father, also a long-time commercial pilot. Al said flying was in the family's blood. 'I taught him, if he ever did, when he was flying, to always look for a place to land. You never know when something is going to happen,” said Merrill. Joshua was a third-generation pilot. On May 7, the C-35 he was piloting lost power and crashed in a Surprise neighborhood. He was killed, but his passenger, Michael Fox, survived. While Joshua flew planes, he preferred to work on them. He was a mechanic by trade and enjoyed being hands-on. His family said he was meticulous and detailed. That's just who he was. “I'm going to miss being able to talk to him about literally anything,” his father said. Merrill said investigators told him they are inspecting throttle components of the plane to try and piece together what happened prior to the crash. The official caused is under investigation. 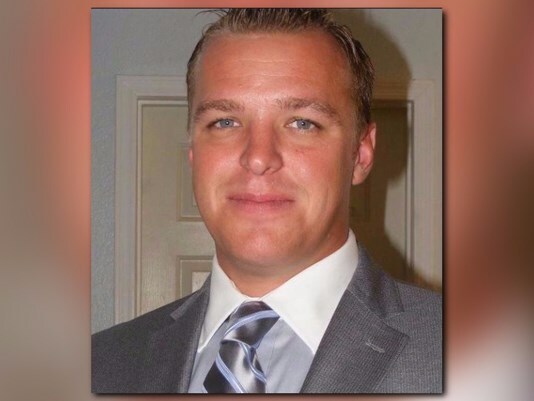 Josh Merrill was the pilot of the small plane that crashed in Surprise May 7, 2016. 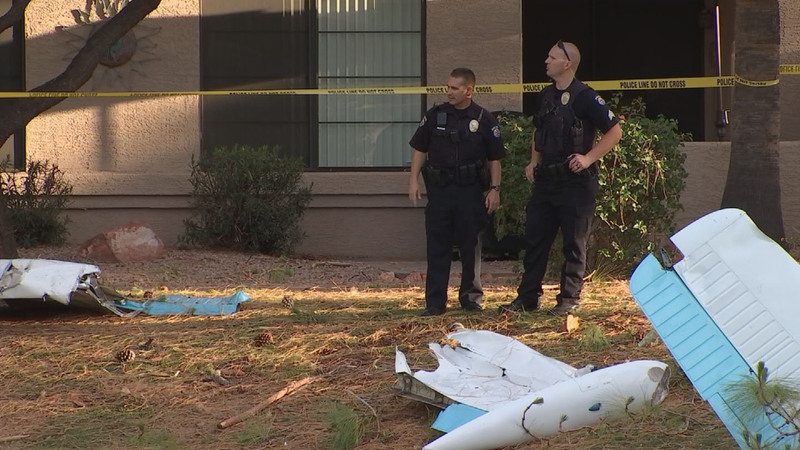 SURPRISE, Ariz. - When a small plane went down in a Surprise neighborhood on Saturday, neighbors couldn’t believe it: The aircraft hadn’t crashed into a house, car or person. But they didn’t know the pilot, 31-year-old Josh Merrill. Merrill, tragically, was killed in the crash. His friend and passenger 32-year-old Michael Fox was the sole survivor. “You have very few choices, and they have to be made right, and they have to be made immediately,” said Jim Tilmon, an aviation expert and CEO of the Tilmon Group. We shared information given to us by Fox’s family about what happened in the flight’s final moments. “Seconds, we're talking about that makes a considerable difference,” Tilmon told 12 News when asked about crash landings. Family members told 12 News the plane lost all power and Merrill, an experienced pilot and airplane mechanic, had just 45 seconds to figure out where to make a crash landing with nothing but houses and busy streets below. What Merrill did next, Tilmon says could only have been done by exceptionally skilled pilot. 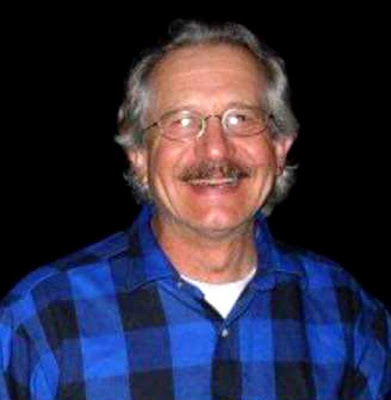 Fox’ family says Merrill spotted the nearest greenbelt in a neighborhood near 14000 West Fire Mesa Trail and on the way down, flew the fuselage of the aircraft between two trees, severing the aircraft’s wings. Pictures from the scene show the wings sliced off from the plane. This lessened the plane’s chances of exploding and causing more damage. While Tilmon didn’t know Merrill personally, he believes without a doubt – his quick thinking actions saved his friend’s life and lives of countless others. Fox remains in the hospital, but according a family member, he has been upgraded from critical to serious condition. 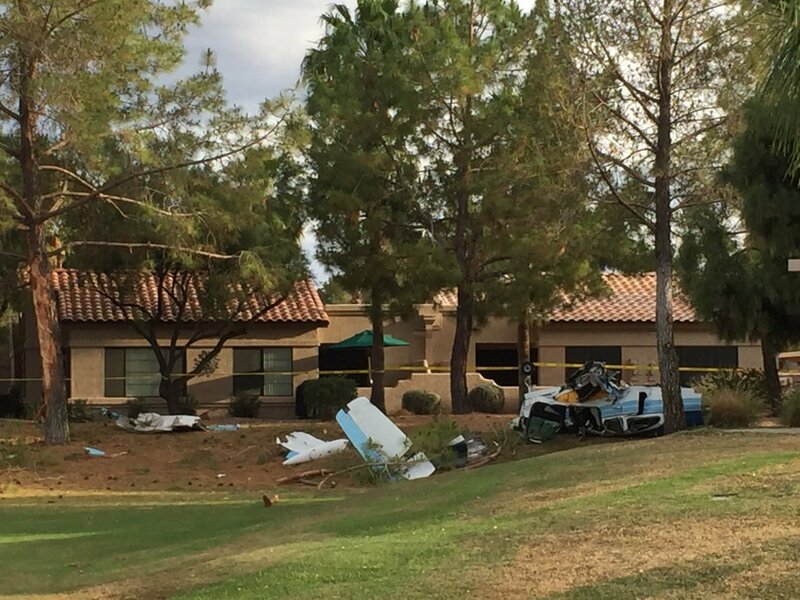 Michael Fox was seriously injured in a small plane crash in Surprise, Arizona Saturday, May 7, 2016. 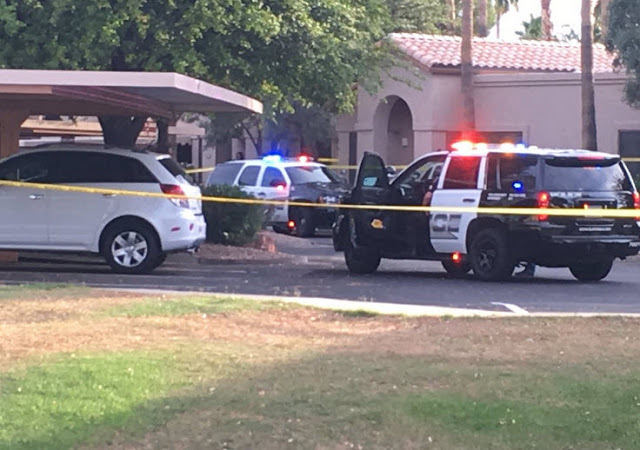 SURPRISE, AZ (KPHO/KTVK) - A Peoria resident aboard a plane that crashed in Surprise Saturday evening has died during surgery, Surprise Police Sgt. Norm Owens said. 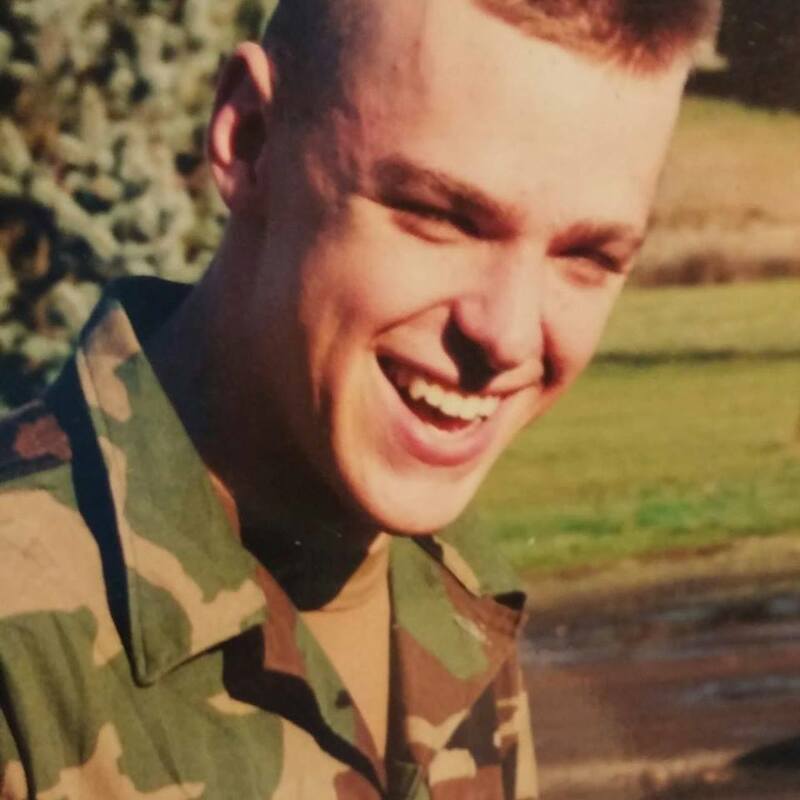 Joshua Merrill, of Peoria, was 31 years old. 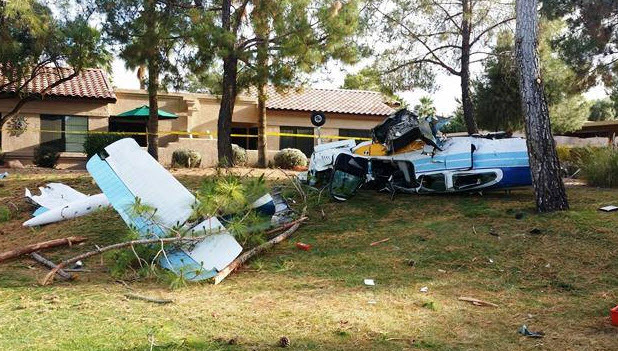 The other person in the plane, Michael Fox, 32, of Glendale, remains in serious condition. The single-engine 1956 Beech G35 aircraft came down around 5 p.m. Saturday in the Sun Village senior citizen community. That's just south of the intersection of Litchfield and Bell roads. Investigators from the Federal Aviation Administration and the National Transportation Safety Board continue to assist the Surprise Police Department in the investigation. "The men and women of the Surprise Police Department are keeping Mr. Fox, his family, and his friends, in their thoughts and prayers. Additionally, we are continuing to pray for Mr. Fox to have a full recovery from his injuries. The Surprise Police are also keeping Mr. Merrill's family and friends in our thoughts and prayers as they go through this most difficult time of mourning." 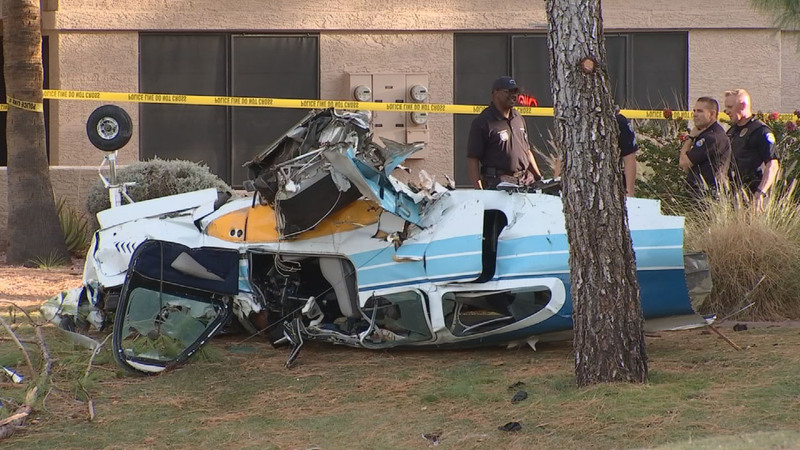 SURPRISE, Ariz. - Surprise Police say that one person was killed in Saturday's plane crash while another remains in intensive care. They have identified the two people inside the plane. Police say 31-year-old Joshua Merrill of Peoria was killed in the crash. They say 32-year-old Michael Fox of Glendale was seriously hurt and is in intensive care on Sunday. 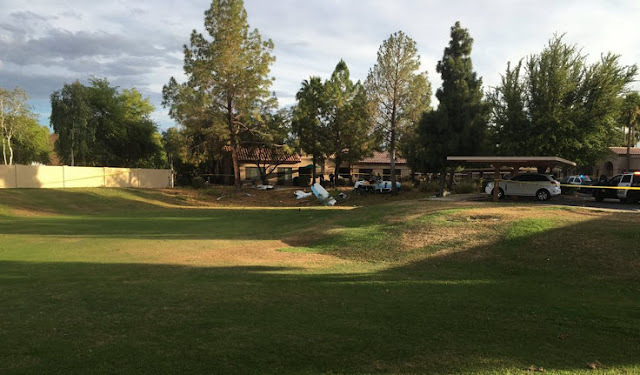 Neighbors in the Northwest Valley were in shock on Saturday after a plane crash landed in their neighborhood earlier this evening. Fox 10’s Danielle Miller was at the scene of the crash. "Everyone was just in shock, ran out, setting like this in this village it's not real," said Tom Hannon, who lives in the community . Tom Hannon and many of his neighbors are in disbelief tonight by what's happened in their quiet community. Surprise police say this single-engine plane crash landed in this green belt area of the Sun Village neighborhood near Litchfield Road and Bell Road around 5:00 pm Saturday. The plane came in from the east. “It just sounded like loud gunshots, we ran out and here it was, a plane, unbelievable," said Hannon. Police say the pilot and only passenger were taken to the hospital, one by ambulance and one by air. "There's not a lot of open fields, like places to I don't know, land a plane, I guess,” said Kelly Murphy-who also lives in the community. “This is one of our biggest fields I guess we have here, other than the open strip and golf course, and I guess he could have been trying to aim for that, but this is probably one of the biggest places and best places he could have landed." Investigators are now on scene trying to determine what caused the plane to go down. Police also tell us the plane luckily didn't hit any homes or people in the area. “For him to not hit anything, I mean he hit a tree, but for him to not hit anything else that's absolutely mind blowing and to have all of this open, like wow," Murphy said. 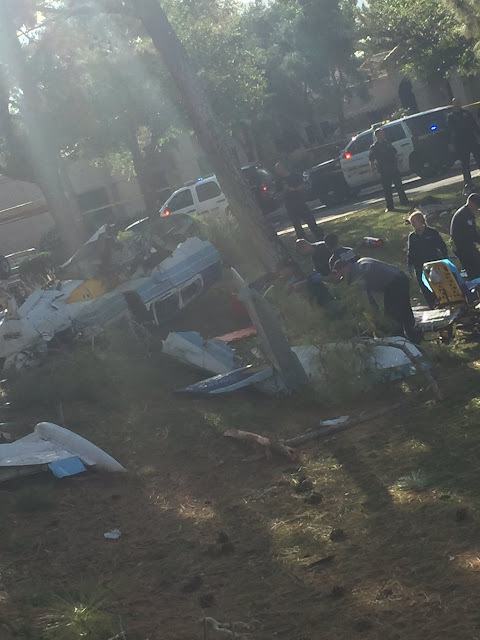 SURPRISE, AZ - Two people have been hospitalized after a small plane crashed in a residential area Saturday afternoon. Surprise police said a Beech 35 Bonanza plane crashed inside Sun Village, a planned community near N. Bell and W. Litchfield roads, around 5 p.m. Residents praised the pilot's skill to land the aircraft in an open area, avoiding homes just a few feet away. “You never think you’re going to have a plane land in your back yard," said Jean Steinken. Both the pilot and sole passenger were alert when first responders arrived, said Sgt. Norm Owens with the Surprise Police Department. “I saw him scoot out of the plane on his fanny, and the other one was laying down," Petty said. The pilot and a passenger were taken to the hospital for evaluation and treatment. Both suffered serious injuries, according to the Surprise Fire Department. Neighbors rushed outside their homes when they heard the impact, just steps away from where they live. “I said, 'My Lord, what was that? The loudest boom!” said Sue Petty. "A lot of our snowbirds have left for the season, so we were real lucky because this park is usually real full of people out here with their animals," said Delilah Smart. No one on the ground was hurt and no homes were hit as the plane crashed, authorities said. “The hand of God had to help them set that plane down because you can see it’s turned upside down and it’s broken into several pieces," Petty said. Looking at the wreckage, she can’t help but get emotional knowing two people were inside. “We just hope and pray that they’re both well," Petty said. The pilot and passenger have not been identified, and authorities have not released the tail number of the plane. Officials from the National Transportation Safety Board and Federal Aviation Administration are investigating the crash. 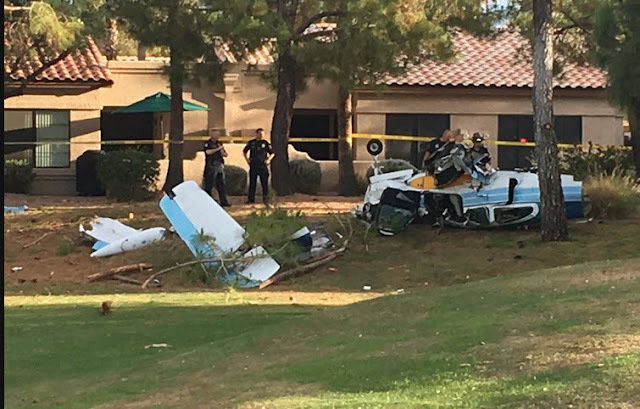 SURPRISE, Ariz. - Police said a small blue and white single-engine plane crashed into a greenbelt area inside Sun Village, a gated community for adults 55 and older in Surprise. No homes were hit or damaged when the plane crashed around 5 p.m. on Saturday, according to officers. Sue Petty lives in the area and is stunned that no homes were hit. Surprise police Sergeant Norman Owens said two people were inside the Beech 35 Bonanza plane when it exploded into the ground, between trees. 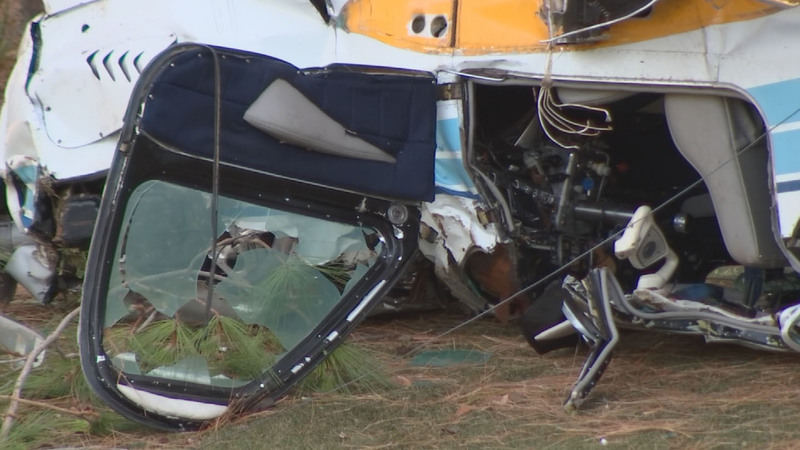 “We are very fortunate that it only collided into the trees, and we’re looking at the injuries only to the pilot and his copilot or the passenger,” Owens said. The plane, coming from the east, authorities said, miraculously missed every home in its path. Homes filled with people living in the retirement community near Bell Road and Grand Avenue. I came running out of a lady’s house and she didn’t hear it," Petty said. "But I thought, man, you ought to be deaf if you didn’t hear it." Firefighters said two people were taken to the hospital with life-threatening injuries -- the pilot and the only passenger. One was taken by ground, the other by air. No traffic delays are expected in the area. Community members said they're praying for the crash victims' recovery. The plane, a Beech 35 Bonanza, crashed under unknown circumstances around 4:20 p.m., according to Ian Gregor, an FAA spokesman. The pilot of the tailwheel equipped airplane reported that during the landing touch down in gusty wind conditions, a gust of wind lifted the left wing. He further reported that he advanced the throttle to abort the landing, and the airplane drifted to the right of the runway. The main wheels touched down on the grass, and the airplane abruptly stopped and nosed over. The airplane sustained substantial damage to the empennage and left lift strut. A review of recorded data from the automated weather observation station located about 10 miles to the west, revealed that, about 23 minutes after the accident the wind was reported as 330 degrees true at 13 knots, and visibility 10 statute miles. The airplane was landing on runway 4. As a safety recommendation, the pilot reported that this accident may have been prevented with more flight time in the airplane type, and that his feet may have been pushing on the toe brakes. The pilot's failure to maintain directional control during landing, which resulted in a runway excursion. Contributing to the accident was the pilot's incorrect brake application during the runway excursion, which resulted in a nose over. BATAVIA TOWNSHIP, Ohio —A strong crosswind caused a pilot to lose control of a small aircraft on a Clermont County runway, causing the plane to flip, according to the Ohio State Highway Patrol. The incident happened around 7:30 p.m. Friday at the Clermont County Airport in Batavia Township. 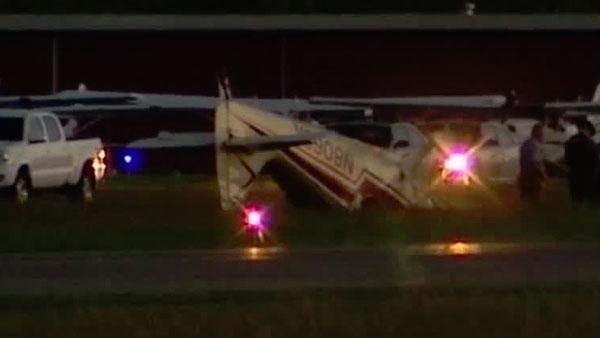 Officials said the pilot lost control of a 1947 Stinson 108-2 aircraft, traveled off the right side of the runway and struck a taxiway light. The plane came to rest on its top. The pilot was the only occupant of the plane. Officials said he was not injured. OGDENSBURG -- Expansion at the Ogdensburg International Airport will force the closure of the runway and the suspension of Cape Air flights for two months this summer. Beginning June 27 and running through Aug. 27, the single runway will be closed to commercial operations including Cape Air flights while the terminal undergoes reconstruction and renovation. General aircraft operations, such as those conducted by airport-based aircraft, can proceed, but pilots would be wise to keep abreast of developments. The runway, taxiways and the terminal will completely shut down from Aug. 15 to 22 while the runway and taxiway extensions, which are under construction now, are tied in to the end of the existing runway length. But Ogdensburg Bridge and Port Authority Executive Director Wade Davis is hoping that the runway tie-in can be done sooner than that, so the airport can return to near-normal operations more quickly. “Construction is going six days a week. 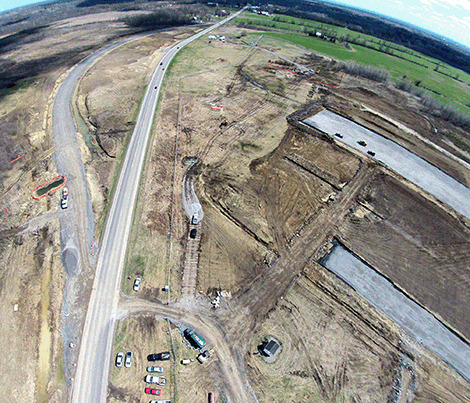 Everything is on track, on budget and actually ahead of schedule,” Davis said. The other major part of the runway extension project is the rerouting of State Rt. 68 to the east to make room for the longer runway, and there, “everything is going well,” Davis said. On the airfield, the date that construction is due to be completely finished is Sept. 30. By then, the 5,200-foot runway will have 1,200 feet added onto the eastern end, bringing the total length to 6,400 feet in order to allow larger commercial aircraft to take off and land there. The taxiways, which parallel the runway, will also be extended to match the new runway length and will be widened. And the airport apron, where the planes pull up and park at the terminal building, will be enlarged. The whole cost of the airport improvements, excluding the terminal and parking lot improvements, will come to $25.6 million, the majority of which comes from the Federal Aviation Administration and the U.S. Department of Transportation. The terminal construction will get about $750,000 from the state Empire State Development agency, which Davis said will come in the form of reimbursements to OBPA “to offset the costs associated with baggage claim improvements” in the terminal. Everything else in the terminal and parking lot projects – an estimated $6.9 million – “is OBPA expense, what OBPA will have invested in this project,” he said. Davis said he is pleased and impressed with the speed with which the project has come together. CW2 Christopher "Chris" A Maggio was a Vietnam Helicopter Pilots Association (VHPA) member who died after his tour in Vietnam on May 06, 2016 at the age of 66.9 from rotorcraft accident. On May 6, 2016, about 1900 Alaska daylight time, an Airbus (formerly Eurocopter) AS 350 B2 helicopter, N94TH, collided with snow-covered mountainous terrain about 4 miles southeast of Skagway, Alaska, after departing from a remote landing site on the Denver Glacier. The commercial pilot received fatal injuries, and the helicopter sustained substantial damage. 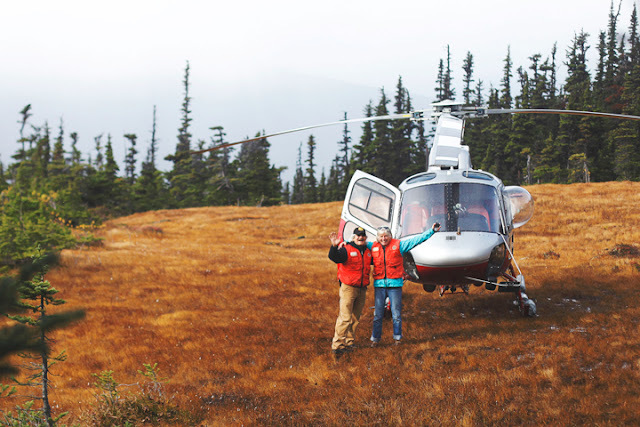 The helicopter was registered to and operated by TEMSCO Helicopters, Inc., Ketchikan, Alaska, under the provisions of Title 14 Code of Federal Regulations (CFR) Part 91 as a visual flight rules (VFR) internal-cargo company flight. Instrument meteorological conditions were reported on the Denver Glacier at the time of the accident, and company flight following procedures were in effect. The flight originated from a heliport at the operator's headquarters in Skagway about 1840, landed at the remote site for several minutes, and departed for the return flight about 1852. Alaska Icefield Expeditions, Inc., contracted with TEMSCO to provide helicopter support for the movement of personnel, dogs, and cargo. The purpose of the flight was to transport dog camp company personnel (mushers) and dogs (Alaskan Huskies) from the operator's headquarters in Skagway to a remote dog camp on the Denver Glacier in the Tongass National Forest, about 5 miles southeast of Skagway. TEMSCO and Alaska Icefield Expeditions conducted heli-mushing operations for the Alaska tourism industry using a helicopter glacier landing permit issued by the US Forest Service. The pilot was scheduled for seven continuous roundtrip flights (without shutting down the helicopter) to the dog camp on the day of the accident. All flights scheduled for the day of the accident fell under the operational control of the base manager, who was located at TEMSCO's headquarters in Skagway. The pilot was ready to begin flight operations at 0800, but low ceilings prevented flight operations. The pilot attended company orientation training at 0900, and, at 1300, he provided helicopter loading training for new TEMSCO employees. At 1530, the pilot completed the training and evaluated the weather for flight operations. The pilot determined that the wind conditions were unsuitable at the time but were forecasted to improve later in the afternoon. The dog camp manager, who was located at the dog camp on the Denver Glacier, was responsible for managing operations of the dog camp. He reported that, on the day of the accident, from about 0600 to 1200, the weather in the dog camp was cloudy, snowing, and foggy, and the visibility was "a few hundred yards." At 1200, the clouds broke, the snow stopped, and visibility was such that he could see through Paradise Valley across the Taiya Inlet. He reported that flight operations were cancelled because of the wind; the wind on the glacier was between 10 and 15 mph. About 1630, TEMSCO informed the dog camp manager, that flight operations would begin to deliver mushers and dogs to the camp. At 1645, the wind speed had dropped significantly at the base, and the pilot decided it was safe to launch. The pilot completed two roundtrips, each with 1 musher and 10 dogs on board the helicopter. The dog camp manager stated that it was snowing as these flights arrived. At 1738, the pilot called inbound from the Denver Glacier to the base, and the base manager asked the pilot about the weather conditions. The pilot reported to the base manger that there was turbulence around the toe of the glacier and that he was keeping his airspeed down for a smoother ride. Based on the pilot's report, the base manager decided to cancel a scheduled external load flight that he had planned to fly and load the cargo internally in another helicopter. At 1747, the helicopter departed from the base for the third trip, again with 1 musher and 10 dogs onboard. En route to the glacier, the pilot reported to the base manager that he "experienced a little bit of inflight icing" at 3,000 ft mean sea level (msl). The base manager asked the pilot what kind of precipitation he was experiencing, and the pilot reported "wet snow." The base manager told the pilot "to do what he thought was best." The pilot responded that he would evaluate the icing conditions as he flew on the subsequent flights. The fourth and fifth roundtrips were completed uneventfully; the fourth carried 1 musher and 10 dogs, and the fifth carried 1 musher and 11 dogs. At 1840, the helicopter departed for the sixth trip with 1 musher and 12 dogs onboard. As the helicopter passed through Paradise Valley, the passenger reported that the valley itself was "wide open" with a rainbow present, but he and the pilot could see that the clouds were "moving in" as the helicopter approached the Denver Glacier. The passenger reported that the clouds were "thick," and he could not see up the glacier toward the dog camp. The passenger further reported that the western mountain wall near the glacier was visible at the time, so the pilot elected to follow the wall into the dog camp "very slowly." He stated that the helicopter was "very low" with regard to the bluff and was closer to the wall than he had ever been on previous flights up to the dog camp. The dog camp manager reported that just before the sixth flight arrived, the wind speed was up to 20 to 30 mph, and it was snowing. The clouds had moved in and covered the bluff; visibility was about a 1/4 mile looking toward Paradise Valley. The helicopter landed at the dog camp, and the musher and 12 dogs were unloaded. Before the pilot left, he signaled for the dog camp manager and told him that he was "not coming back in this weather." The dog camp manager verbally agreed. The dog camp manager told the pilot to be safe, and the pilot said to the dog camp manager, "but don't give up on me yet." The pilot then departed from the dog camp at 1852 and headed toward Paradise Valley. According to the dog camp manager, the helicopter traveled about 1/8 mile toward Paradise Valley, turned around, and then turned north. The dog camp manager reported that the visibility looking north from the dog camp appeared to be about 1/4 mile. He noticed that the snow rate had picked up "considerably," and the wind speed was still between 20 and 30 mph. A review of Harris OpsVue track data was conducted during the timeframe of 1815 to 1915. The OpsVue data indicated the accident helicopter was making multiple 360° turns before turning to the north and east and continuing to make turns. As the helicopter was tracking toward the east, the altitude was trending up in a slow climb before descending near the accident site. About 1900, the TEMSCO base manager noted that he had not heard any communication on the radio for a few minutes, so he asked about the status of the accident helicopter and noticed on the flight tracking computer that the helicopter's position was northwest of the dog camp at an elevation of about 6,200 ft msl, about 2,000 ft above the dog camp's elevation. He made several radio calls to the pilot, and no responses were received. After repeated radio calls with no response from the pilot, the base manager decided to launch in a helicopter with an observer on onboard. The company emergency response plan was activated. At 1914, the base manager departed to the last known coordinates of the missing helicopter. The base manager reported that he was unable to fly over the dog camp via Paradise Valley at 1924 due to low ceilings, blowing snow, and turbulence. At 1942, the base manager reported that he was maneuvering near the North Denver Icefall area, and he was unable to climb higher than 4,000 ft msl due to low ceilings, blowing snow, and "mechanical" turbulence. By 1948, the base manager reported "improving" ceilings and being able to maneuver around 5,000 ft msl. At 2009, the base manager and observer visually confirmed the wreckage of the accident helicopter lying on its left side with the tailboom separated in steep, mountainous terrain near a frozen glacial lake, about 2 miles northeast of the dog camp. After the base manger confirmed the location of the wreckage, he asked if the dog camp personnel could travel to the wreckage site. The dog camp manager and several other workers rode two snow machines toward the wreckage; they noted the wind speed was between 30 and 40 mph and visibility was between zero and "a few hundred feet" in blowing snow. As they proceeded toward the wreckage, the wind speed increased to between 50 and 70 mph. The dog camp personnel were unable to proceed any farther due to the steep terrain and the possibility of avalanches. The base manager attempted multiple times to land at the accident site but was unable to land due to high wind and flat light conditions. About 2200, a US Coast Guard helicopter attempted to access the accident site but was unsuccessful due to the wind conditions. After dumping fuel, the Coast Guard helicopter was able to access the accident site, and an aviation survival technician (helicopter rescue swimmer) confirmed one fatality in the wreckage. The pilot, age 66, held a commercial pilot certificate with a rotorcraft-helicopter rating and held private pilot privileges for airplane single-engine land. The pilot did not have and was not required to have a helicopter instrument rating. His most recent second-class medical certificate was issued on February 27, 2016, with the limitation that he must wear corrective lenses. According to the operator, the pilot's total aeronautical experience was about 7,190 hours of which about 5,700 hours were in the accident helicopter make and model. In the 90 and 30 days before the accident, the pilot flew 5 and 3 flight hours, respectively. This was his 25th season with TEMSCO. The operator's pilot training records showed no deficiencies and indicated that the pilot had completed all required training, including a competency check ride on March 19, 2016. The Skagway base manager, age 30, held a commercial pilot certificate with a rotorcraft-helicopter and instrument helicopter rating. His total aeronautical experience was about 3,445 hours, and this was his eighth season with TEMSCO. All of his eight seasons were in Skagway. Registered Owner: TEMSCO HELICOPTERS, INC. The 1991-model-year helicopter was equipped with a Safran (formerly Turbomeca) Arriel 1D1 turboshaft engine. According to the operator's records, at the time of the accident, the helicopter had accumulated 10,190.5 flight hours, and the engine had accumulated 4,281.6 hours. The most recent inspection of the airframe and engine was completed on December 17, 2015. 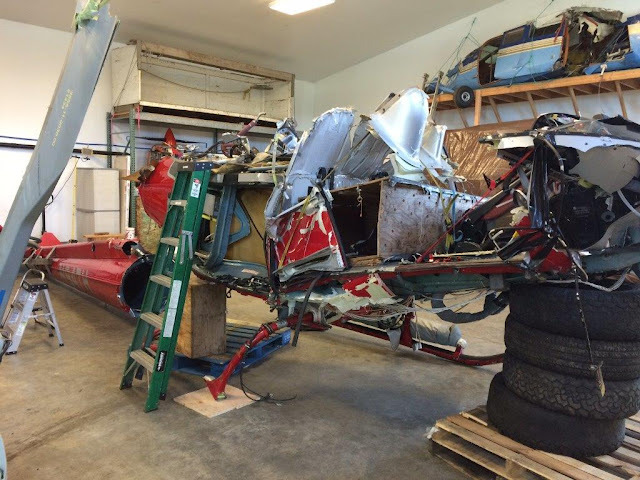 An examination of the helicopter's maintenance records revealed no evidence of uncorrected mechanical discrepancies with the airframe and engine. The helicopter was originally manufactured as an AS 350 B and was converted to an AS 350 BA in 1992 and then to an AS 350 B2 in 2003. The helicopter was configured to be flown from the right front seat, which was a non-energy attenuating, fiberglass seat. The left front seat that was installed in the helicopter was a single-place, non-energy attenuating, fiberglass seat. The helicopter was not equipped with a radar altimeter, nor was it required to be at the time of the accident. The helicopter was equipped with a Federal Aviation Administration (FAA) Capstone Project avionics package. The skid system of the helicopter included snow/tundra boards mounted on the aft ends of both skid tubes along with an emergency floatation system on both skid tubes. TEMSCO configured the helicopter cabin to facilitate the transportation of internal cargo. The rear seat assembly was folded up against the cabin wall, and two wood, dog transportation boxes were placed behind the front seats. A tarp, blanket, and wood shoring were placed between the lower box and the cabin floor. The dog boxes were stacked vertically and secured using two cargo straps attached to a total of four seat belt attachment rings installed on the floor of the cabin. Both cargo straps were secured to the rear seat belt attachment points in front of the aft cabin wall, routed over the top of the stacked boxes, and secured to the pilot and front passenger seat belt attachment points. With the configuration of the two cargo straps, forward restraint was present; however, no lateral restraint was present. Neither dog box had a placarded weight value on the outside of it. 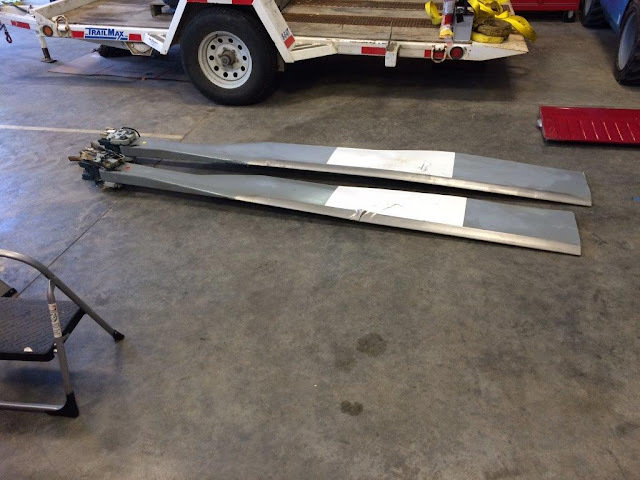 The make and model of the cargo straps, as well as the maximum load rating of the straps, could not be determined. The two cargo straps had abrasions at various locations along with unknown stains throughout the length of the straps. The Airbus AS 350 B2 rotorcraft flight manual (RFM) discusses required placards in the limitations section and states that a loading instruction placard is to be mounted on the side face of the control pedestal. On the accident helicopter, the placard was found mounted on the rear of the control pedestal. This placard listed the "distributed loads maximum" for the rear cabin floor as 682 pounds. The combined weight of the two wood dog boxes was 190.5 pounds; the wood boards used for shoring on the cabin floor weighed 9.5 pounds; and the blanket, tarp, and two cargo straps weighed 5 pounds. The total weight of 205 pounds was not included on the cargo manifest documents for the day's flights or the helicopter's weight and balance record. On each of the first four flights from Skagway to the dog camp, the total dog weight entered on the cargo manifest form was 500 pounds (10 dogs on board). On the fifth flight, the dog weight entered was 550 pounds (11 dogs on board). On the sixth flight, the dog weight entered was 600 pounds (12 dogs on board). For all six flights from Skagway to the dog camp, the weight of the dog boxes and related items (205 pounds) combined with the dog weight resulted in the structural limitation of 682 pounds being exceeded. The closest official weather observation station to the accident site was located at the Skagway Airport, Skagway, about 4 miles northwest of the accident site. At 1853, the reported weather conditions were wind 210° at 19 knots gusting to 28 knots, visibility 10 statute miles, few clouds at 8,000 ft, temperature 53°F, dew point 37°F, and altimeter setting 29.81 inches of mercury. Refer to the Meteorology Group Chairman's Factual Report in the public docket for further weather information. On May 8, 2016, the NTSB investigator-in-charge (IIC), along with an additional NTSB investigator, an aviation safety inspector (ASI) from the FAA's Juneau Flight Standards District Office (FSDO), and a representative from TEMSCO traveled to the accident scene via helicopter. All the major components of the helicopter were found at the main wreckage site. The accident site was in an area of steep, mountainous terrain covered with deep snow, at an elevation of about 4,200 ft mean sea level, near a frozen glacial lake. The impact point of the helicopter was on about a 090° heading (magnetic). Scattered downslope from the helicopter were small portions of wreckage debris, broken Plexiglass, and personal effects. The helicopter fuselage was lying on its left side with the nose oriented to the south. The Artex ME406 emergency locator transmitter (ELT) antenna wire had separated during the accident sequence. The cockpit was severely damaged with extensive deformation. The canopy was segmented and separated with all canopy glass windscreens and overhead transparencies shattered or missing. The cockpit levers and switches appeared to be configured for normal flight except for the guarded HYD TEST (in position), BATT/EPU (off position), and HORN switch (out position) on the center console, which had sustained impact damage. The aft cabin was bent and buckled inward along the upper roof area. Both cargo straps used to secure the dog boxes were found separated. The top dog box was lodged in the forward cockpit area against the rear of the pilot's seat. The pilot's seat sustained multiple fractures to the rear and base of the seat, and the seat was separated from the floor. The bottom of the fuselage exhibited severe deformation with a large section of the skin missing just below the fuel cell. The left skid remained relatively intact and was buried in snow. The right skid tube separated from the two crosstubes. The tailboom separated from the fuselage just aft of the fuselage. Both tail rotor blades exhibited damage consistent with multiple terrain strikes under power. 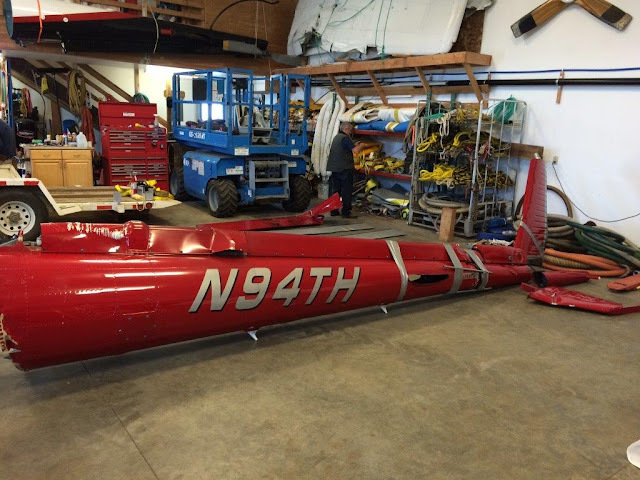 The yellow main rotor blade remained attached to the Starflex assembly and was lying downhill from the fuselage. The red and blue main rotor blades, including part of the Starflex assembly, were partially buried beneath the snow and underneath the fuselage. All main rotor blade portions visible above the snow exhibited damage consistent with sudden stoppage associated with multiple terrain strikes while under power. The main rotor system, transmission, and engine areas displayed damage consistent with rolling over while under power after the initial impact with terrain. The left side of the main rotor system, transmission, and engine were lying against the snow-covered terrain. No evidence of preimpact mechanical anomalies with the airframe and engine were found during the onsite examination. The wreckage was recovered from the accident site and transported to a secure hangar at the Juneau International Airport, Juneau, Alaska. On June 9, 2016, a wreckage examination and layout were done under the direction of the NTSB IIC. Also present were an ASI from the FAA Juneau FSDO, an air safety investigator from Airbus, an air safety investigator from Safran, and three representatives from TEMSCO. During the examination, no preimpact mechanical malfunctions or failures with the airframe and engine were noted. The helicopter was not equipped and was not required to be equipped with a cockpit voice recorder, flight data recorder, or image recorder. 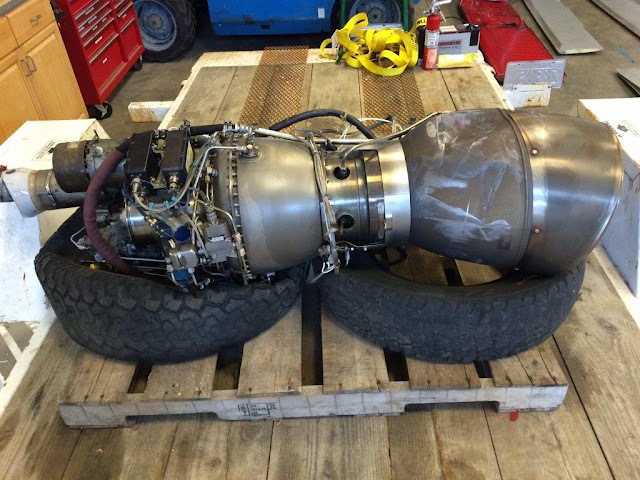 A Latitude Technologies S200-001 flight tracker, a Garmin GDL 90 datalink transceiver, and an AKV ETM 1000 engine and rotor system monitoring device were recovered from the wreckage. These electronic devices were not designed for crash resistance or survivability. The Latitude Technologies Corporation S200-001 flight tracker, which was used by TEMSCO for flight tracking purposes, was transported to the manufacturer's facility in Victoria, British Columbia, Canada, for an examination of the unit and subsequent data download. According to the manufacturer, the unit had the original firmware installed from when the unit was released in February 2009 with no subsequent firmware updates. The manufacturer additionally reported that this build of firmware had a previously unknown "bug" resulting in the data being captured in the background log being identical to the data that were transmitted while the helicopter was in flight with no additional GPS data in between the transmitted logs being captured. At the time of the accident, the operator had the "ping rate" set to every 120 seconds. The Garmin GDL 90 and the AK ETM 1000 devices were submitted to the NTSB Vehicle Recorder Laboratory in Washington, DC, for examination and download. No track or navigation data was stored on the Garmin GDL 90. Various engine and main rotor system parameters were recorded for the accident flight on the AK ETM 1000. Refer to the Recorder Specialist's Factual Report in the public docket for further information regarding the Garmin GDL 90 and an AKV ETM 1000 devices. The Alaska State Medical Examiner, Anchorage, Alaska, conducted an autopsy of the pilot. The cause of death for the pilot was attributed to multiple blunt force injuries. The FAA's Bioaeronautical Research Sciences Laboratory, Oklahoma City, Oklahoma, performed toxicology tests on specimens from the pilot that were negative for carbon monoxide, ethanol, and drugs. Cyanide tests were not performed. 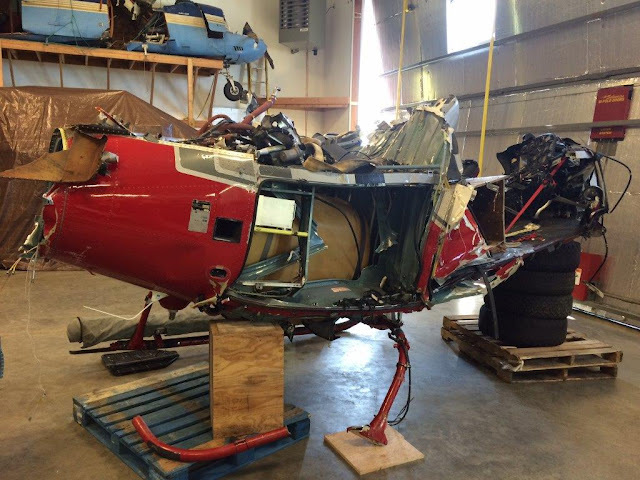 The caution-warning light panel from the helicopter was submitted to the NTSB Materials Laboratory for examination. The panel was x-rayed to determine the filament status of the light bulbs within the panel. The examination determined that none of the filaments exhibited hot filament stretching. Helicopter flights during icing conditions are prohibited. TEMSCO shall not fly into known icing conditions. If icing conditions are encountered, the Pilot-in-Command will deviate from course to avoid and navigate around any encountered icing conditions. The Airbus AS 350 B2 Rotorcraft Flight Manual lists "flight in freezing rain or icing conditions (visible moisture and temperatures likely to produce ice)" as a prohibited maneuver in the limitations section. Operational control with respect to a flight, means the exercise of authority over initiating, conducting, or terminating a flight. The Director of Operations and the pilot in command are jointly responsible for the initiation, continuation, diversion, and termination of a flight. The Director of Operations may delegate functions to other trained personnel, but retains responsibility for initiation, continuation, diversion, and termination. The final authority over conducting or terminating a flight rests with the pilot in command. The following persons have "operational control" with respect to flight in descending order: director of operations, chief pilot, pilot in command, second in command, director of maintenance, base managers, base lead pilot, and trained flight followers. Loss of operational control within the air carrier – hands-off management results in inadequate controls over its own operations. Management of operations should never be inattentive, distracted, or careless. Hands-off management is not a legitimate excuse for failing to maintain operational control. FAA Operations Specification A008 Operational Control states that non-management personnel exercising operational control shall be specified in the general operations manual (names, titles, duties, responsibilities, and authorities). A review of the TEMSCO Operations Manual showed that, for the operational control chain of command, the base lead pilot positions were listed "as assigned" with no names listed, and the trained flight follower positions had no names listed. A formal flight risk assessment was not conducted by the pilot for the accident flight, nor was it required by the operator at the time of the accident. The TEMSCO Safety Management Systems Manual states that flight risk assessments are to be conducted for emergency medical services and tour operations. The TEMSCO Operations Manual discusses company VFR weather minimums and states that, for the local operating area (within a 30-nautical-mile radius from the base of operations), a 500 ft ceiling or greater and 1 statue mile visibility or greater is required. The manual states that the lowest of the ceiling or visibility shall be the limiting factor for dispatch. A review of the TEMSCO Operations Manual found no operational procedures listed for flight operations in deteriorating VFR weather conditions (such as reduced visibility and ceilings), inadvertent instrument meteorological conditions (IIMC) avoidance procedures, or IIMC recovery procedures. Will be secured by means approved by the FAA. Will be carried in accordance with each of the following: Will be properly secured by a safety belt or other tie down having enough strength to eliminate the possibility of shifting under normally anticipated flight and ground conditions. Will be packaged or covered to avoid possible injury to passengers. It will not impose any load on seats or on the floor structure that exceeds the load limitations for those requirements. It will not be located in a position that restricts the access to or use of any required emergency or regular exit, or the use of the aisle between the crew and the passenger compartment. It will not be carried directly above seated passengers. Each bay or bin will be able to withstand the load factor as applicable to passenger seats of the aircraft. The maximum weight of cargo that each bin or bay is approved to carry will not be exceeded. Each bay will be loaded to insure proper weight distribution when using cargo load schedule. The load will not impose any load on the floor or other structure of the aircraft that exceeds the limitations of that structure. The maximum concentrated load for each compartment will not be exceeded. The bin or netting for loose cargo will be attached to the seat tracks or to the floor structure of the aircraft and its attachment must withstand the load factors applicable to the passenger seats. The cargo will not restrict access to or use of any required exit or aisle in the passenger compartment. It will be the responsibility of the Pilot-In-Command to check and ensure that all cargo and passenger doors are properly secured prior to any flight. The operator reported that before the accident, the company conducted internal cargo load training for contract, charter, and utility pilots at company headquarters in Ketchikan, which was hands-on training that was both mission-specific and aircraft-specific with no training syllabus or published curriculum at the time. The training was not conducted with the tour pilots. After the accident, the operator developed internal cargo loading guidelines for all company Airbus AS 350 pilots. This document covers cargo strap standards (what type to use), the various helicopter floor weight limitations, and the various limitations of the mooring rings. The document also highlights the importance of not exceeding any limitations of seat-belt-based mooring rings when a ring is used to restrain cargo and the seat is occupied. At the time of the accident, the operator was a member of the Tour Operators Program of Safety (TOPS). The most recent TOPS compliance audit on the operator before the accident took place from August 8 through August 10, 2015. All the audit areas (management, safety, flight operations, pilots, flight coordination, heliport, maintenance, maintenance personnel, and ground support personnel) along with base visits and flight observations were classified as "meets TOPS standards." As previously stated, review of the Airbus AS 350 B2 RFM found that it discusses required placards in the limitations section and states that a loading instruction placard is to be mounted on the side face of the control pedestal. No other information regarding the carriage of cargo in the cabin was found in the RFM. Regarding internal cargo, the Airbus AS 350 Systems and Descriptions Manual states, "further to removing the front [left seat] and folding back the rear benches, the cabin floor can be used to transport cargo. The eleven mooring points are embedded into the floor and are also used to attach the seatbelts." The manual also lists the "limit permissible force on a mooring ring" as 620 dekanewtons or 1393.7 pound-force. A search revealed no regulatory guidance or best practices available from the FAA regarding the care, inspection, and maintenance of cargo straps used for internal cargo operations with helicopters. There are numerous classic behavioral traps that can ensnare the unwary pilot. Pilots, particularly those with considerable experience, try to complete a flight as planned, please passengers, and meet schedules. This basic drive to achieve can have an adverse effect on safety and can impose an unrealistic assessment of piloting skills under stressful conditions. These tendencies ultimately may bring about practices that are dangerous and sometimes illegal and may lead to a mishap. Pilots develop awareness and learn to avoid many of these operational pitfalls through effective single-pilot resource management training. Flying weather in Alaska can be quite variable depending on the climate zone and time of year. Although all parts of Alaska experience periods of instrument meteorological conditions (IMC), such conditions are frequent in the Aleutian Islands, Alaska Peninsula, southeast Alaska, and the Arctic Coast during the summer and early fall. Weather conditions can change rapidly in Alaska, and the vast distances between some reporting points will often conceal significant local variations in the weather. VFR flight into IMC usually involves poor pilot decision making, whether in initiating the flight or continuing it into adverse weather. The operator was asked by the NTSB IIC if any aviation training devices (ATD), flight training devices (FTD), or full flight simulators (FFS) for training Airbus AS 350 pilots in Alaska in areas such as flight operations in flat light conditions, flight operations in degraded visual meteorological conditions, and IIMC recovery were utilized. The operator reported that they use the actual helicopter and real-world training scenarios when training their pilots for operations in flat light conditions and degraded visual meteorological conditions. The operator has their pilots use instrument hood devices to train for IIMC avoidance and recovery. Additionally, the operator uses the actual helicopter and an FAA Capstone Project training device to assist in training terrain avoidance. The operator further reported that they are in the process of acquiring a level 5 FFS for the Airbus AS 350. On May 6, 2016, about 1855 Alaska daylight time, an Airbus AS350B2 helicopter, N94TH, collided with snow-covered terrain while en route to Skagway, Alaska, about 4 miles southeast of Skagway. The commercial pilot sustained fatal injuries, and the helicopter sustained substantial damage. The helicopter was registered to, and operated by, Temsco Helicopters, Inc., Ketchikan, Alaska, as a day, visual flight rules (VFR) flight under the provisions of 14 Code of Federal Regulations Part 135 on-demand charter flight. Marginal visual meteorological conditions were reported on the Denver Glacier at the time of the accident, and company flight following procedures were in effect. The flight originated from the operator's heliport in Skagway, about 1840. During an interview with the National Transportation Safety Board (NTSB) investigator-in-charge (IIC) on May 9, the operator reported that the pilot departed from the operator's heliport to drop off one passenger and 12 dogs at a remote dog sledding camp situated on the Denver Glacier. The pilot dropped off the single passenger and the 12 dogs and departed to return to the heliport with the dog crates onboard the helicopter. The helicopter flew towards the previously used aerial return route to the southwest, and then the helicopter turned and flew to the north. Visibility was reported for the previously used aerial return route as about 1/4 mile, and to the north of the dog sledding camp visibility was reported as about 1/2 mile. The helicopter was classified as overdue by the operator and a second company helicopter departed from the heliport at Skagway to check on the status of the overdue helicopter. The second helicopter aircrew discovered the overdue helicopter resting on its left side with the tailboom separated in steep mountainous terrain in close proximity to a frozen glacial lake, about 2 miles northeast of the dog sledding camp. The helicopter sustained substantial damage to the main rotor system, the fuselage, the tailboom, and the tail rotor system. 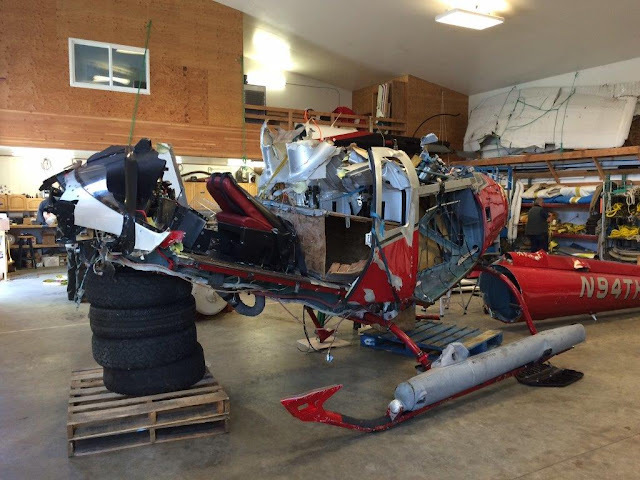 On May 8, the NTSB IIC, along with an additional NTSB investigator, an inspector from the Federal Aviation Administration's Juneau Flight Standards District Office, and a representative from Temsco Helicopters traveled to the accident scene. 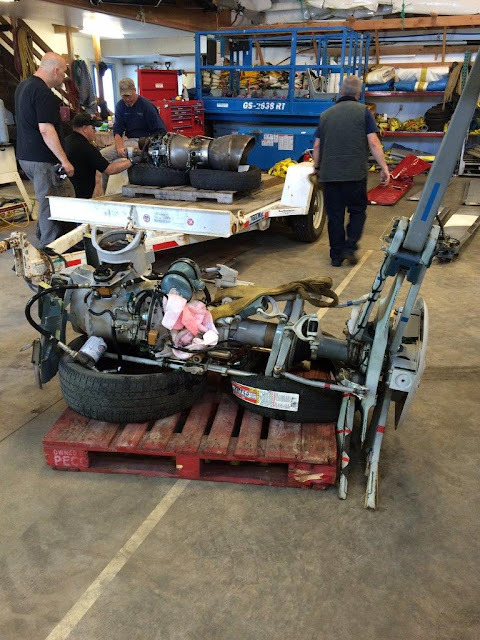 The wreckage was recovered and transported to a secure facility for future examination of the airframe and engine. The closest official weather observation station is located at the Skagway Airport (AGY), about 4 miles to the northwest of the accident site. At 1853, an Aviation Routine Weather Report (METAR) was reporting, and stated in part: Wind 210 degrees (true) at 19 knots, gusting to 28 knots; visibility 10 statute miles; clouds and sky condition, few clouds at 8,000 feet; temperature 53 degrees F; dew point 37 degrees F; altimeter 29.81 inHg. OTHER EQUIPMENT: Pop out floats. DESCRIPTION OF ACCIDENT: Crashed into a glacier in windy conditions. DESCRIPTION OF DAMAGES: Heavy impact damage to airframe. Engine ingested debris. Rotors all damaged. Tail boom damaged. REMARKS: Aircraft is locked in a storage container. Must have an appointment to inspect. Chris Maggio and Becky Silvers Mull pose for a photo after dropping off supplies to Upper Dewey Lake in preparation for Kate and John Harmon’s wedding in 2015. On May 6, Skagway lost a piece of its heart. It was a loss felt round the valley, echoing off mountain caps with rockslides and rainbows that could only be described as resistance to the pain and celebration of a life cut too short. Longtime Temso Helicopter Inc. pilot and beloved Skagway resident Christoper Maggio, 59, died after his helicopter crashed near Denver Glacier during a supply run return from Alaska Icefield Expedition’s’ sled dog camp. At 7 p.m., when his arrival back to Temsco’s base was overdue, management made the decision to send a helicopter to search for him. His crashed helicopter was found at 8 p.m. by a fellow Temsco pilot. Alaska State Trooper Ryan Anderson said the cause and time of the crash remains unknown but is under investigation by the National Transportation Safety Board personnel. NTSB Aviation Accident Investigator Mike Hodges said the Airbus AS350B2 helicopter impacpted the terrain under unknown circumstances, and the wreckage is in the process of being recovered. While a complete report of the crash could take up to a year and a half, he said a preliminary report will be available on their website within five to 10 days. “We want to do a methodical and in-depth investigation of the man, the machine and environment,” he said. The U.S. Coast Guard was alerted of the crash and sent assistance from Sitka at 8:26 p.m. Search and rescue confirmed only Maggio was on board. His body was recovered by the Skagway Fire Department and was sent to the medical examiner in Anchorage for an autopsy. Temsco Vice President of Tours and Marketing Tim McDonnell said Maggio had worked for the company for more than 20 years. The loss of a pilot and friend has hurt the Temsco family as much as it has the community of Skagway. News of Maggio’s death sent waves of grief throughout the valley. Facebook feeds were flooded with memories and photos, each one highlighting a kind heart, glowing smile and his love for flying. In 1997, Maggio rescued a pilot and passenger from a Haines Airways crash that took the lives of four others. As reported in the Juneau Empire, Maggio and Ben Tatone arrived just outside of Burro Creek in just seven minutes, sending emergency floats to the survivors. They guided rescue boats to the women who were then brought back to shore. He was quoted as saying he wished they could have done more. He was recognized by the Federal Aviation Administration in 2013 with his inclusion in the prestigious FAA Airmen Certification Database, listing him as a pilot who has exceeded the high educational, licensing and medical standards established by the FAA. Maggio had a love for antique cars, music, his family and his partner Denise Caposey. 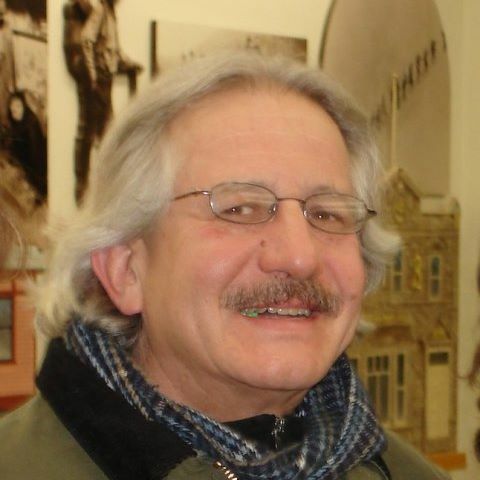 He was a former Skagway School Board member and an active member of the Skagway Arts Council. He taught a ukulele workshop at the school for three years and was known for his musical talents. But of all the things he was known for, he was known most for his great smile and infectious kindness. On a personal note, I saw Maggio on Friday. As he drove past, we smiled and waved. I can’t say I knew him well, but he always had kind words for the paper and a smile to share, accompanied by a twinkling eye revealing his love and light. His death has created a well of grief for all who knew him, if only by a few passing phrases and smiles. Grief in Skagway is similar to love in Skagway. It is strong and loud and all at once. It is all encompassing and filled with emotion. In a way, grief in Skagway is love. It is a love for the community, love for family, love for each other and love for a man who will never be forgotten. A celebration of life will be held in Maggio’s memory today from 4 p.m. to 7 p.m. at Temsco Helicopters on the Ore Dock. All are welcome to attend. Last Friday, rainbows welcomed Maggio into the sky. Last Saturday, boulders fell from the mountain, crushing a considerable section of train track. The valley mourned the loss of one of its own, and Skagway did too. A Skagway helicopter pilot if dead following a crash outside Skagway on Friday evening. The pilot was 59-year-old Christopher Maggio of Skagway. Maggio was the only person on board. According to an Alaska State Trooper report, the U.S. Coast Guard contacted troopers Friday evening around 8:30 to report that a helicopter had gone down near the upper portion of the Denver Glacier, six miles east of Skagway. A Coast Guard helicopter crew from Sitka to locate the crash site and confirmed the pilot was deceased. Skagway Search and Rescue recovered Maggio on Saturday afternoon. Maggio’s remains will be sent to the State Medical Examiner’s office in Anchorage for an autopsy. Next of kin have been notified. This is the second Southeast helicopter crash this week. Tim DeSpain is a public information officer for the troopers. He said Saturday that the helicopter was returning to the Skagway base from the glacier dog camp after dropping off supplies when it went down. The National Weather Service called for cloudy, windy conditions Friday afternoon and evening. Wind gusts were estimated at around 40 miles per hour. The cause of the crash is unknown. According to Joe Vicks, Temsco’s senior vice president, the pilot was overdue from his supply drop as of 7 p.m. Friday. He said another Temsco helicopter was launched at 7:12 p.m. from Skagway and at 8 p.m. the aircraft was located and the Coast Guard notified. Rescue efforts were then coordinated with the U.S. Coast Guard and local fire and rescue teams. The National Transportation Safety Board has started an investigation into the cause of the crash. “The entire Temsco family is deeply saddened by this tragic incident, and our thoughts and prayers go to the family and loved ones of our pilot,” Vicks said. As the summer tourist season gears up, helicopters are busy flying gear, guides and sled dogs to summer glacier camps. An Era helicopter crashed on the Norris Glacier outside Juneau on Thursday, injuring the pilot. Both the Norris and Denver glaciers serve as seasonal basecamps for different sled dog tour companies. A pilot was killed when his helicopter crashed near a glacier in Skagway, the Alaska State Troopers reported late Friday. The Coast Guard in Juneau contacted troopers to report the crash at 8:26 p.m. Friday near the upper portion of Denver Glacier, the report said. The pilot’s name has not been released, pending notification of family. The recovery of the pilot's body was in progress Saturday morning, with local authorities in Skagway conducting the effort, said Tim DeSpain, a troopers spokesperson. The helicopter belonged to TEMSCO, he said. The company offers charters and tours in Southeast Alaska. DeSpain said the helicopter was returning from a TEMSCO dog camp on the Juneau Icefield, he said. “I’m pretty sure he was dropping off supplies, not people,” said DeSpain, referring to the pilot. TEMSCO could not immediately be reached. ANCHORAGE – A pilot was killed after their helicopter crashed on the Denver Glacier in Skagway Friday, Alaska State Troopers report. A spokesman from U.S.Coast Guard Sector Juneau said local flight command reported the helicopter was overdue, leading them to launch a helicopter with crew from Sitka to conduct a search. The USCG said the downed helicopter was located at roughly 10:40 p.m., and a single crew member was lowered to investigate the site. The USCG contacted troopers about the crash after they verified the pilot, the sole occupant of the aircraft, was dead, an online dispatch said. The crew was unable to retrieve the pilot’s body due to conditions at the time, according to the Coast Guard, so Skagway Search and Rescue was contacted. 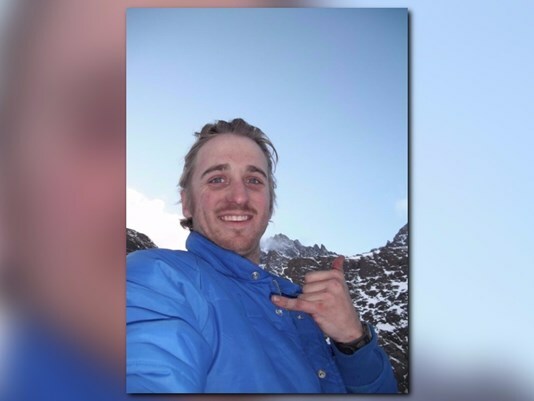 They were dropped off at a nearby campsite by Temsco Helicopters Friday night and made plans to retrieve the body Saturday, troopers said. The identity of the pilot is being withheld until their family can be notified. A Skagway pilot was killed after a helicopter crashed near Denver Glacier early Friday evening. The pilot’s identity has yet to be released to the public. Alaska State Trooper Ryan Anderson said the helicopter went down on its way back from TEMSCO’s dog camp located on the Juneau Icefield. Time and cause of the crash remains unknown and will fall under the National Transportation Safety Board’s jurisdiction. According to Anderson, a second helicopter was sent looking for the first and found the crash near the Denver Glacier. The US Coast Guard was alerted and sent assistance from Sitka on Friday at 8:26 p.m.
Search and rescue was deployed and confirmed that there were no survivors and only the pilot on board.